These two British Columbia companies are intimately related with each other and with FPL. The list of TBMs that participated in the NB spray program is presented for both companies together, as Conair acquired the surviving Skyway TBMs and FPL acquired the surviving Conair TBMs. 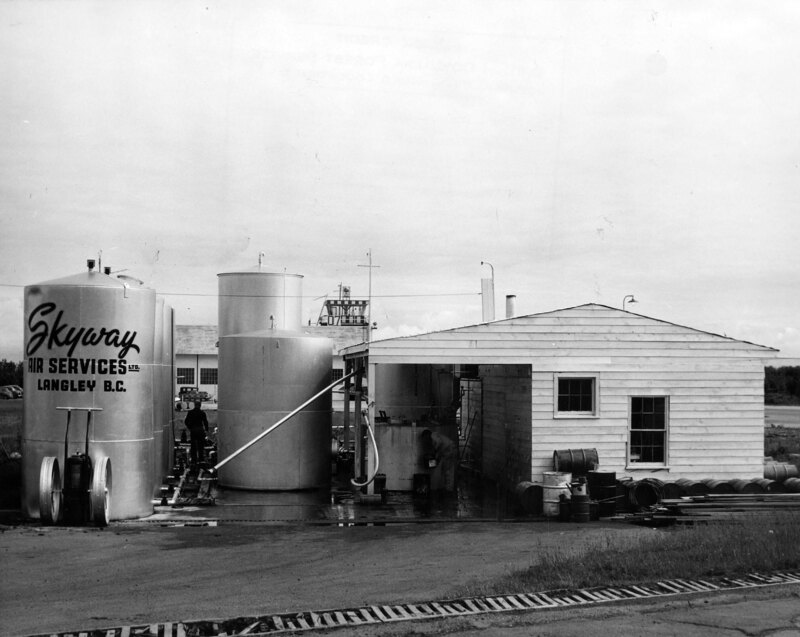 Together with Wheeler Airlines, Skyway supplied the first TBMs to the spray program (1958 to 1968). Conair supplied TBMs it acquired from Skyway to the spray program from 1969 to 1977; the remaining eight were sold to FPL. According to Norm Ralston, three of the four Ball-Ralston TBMs owned by his father “Swede” Ralston and Ed Ball, N5635N, N7026C, N7922A, were sold to Parson Airport, Inc. in Carpenteria, CA. He believed the other, N66475, was later sold to Art Sellers up in Vancouver BC, who later on purchased the other three. This is an assumption based on the fact that the Skyway logo was painted on their sides, along with the US registration, for the 1957 Western Spruce Budworm spray operations, the first time that TBMs were used in Canada. For more details on these four Avengers, see The First TBM/TBF Avenger? 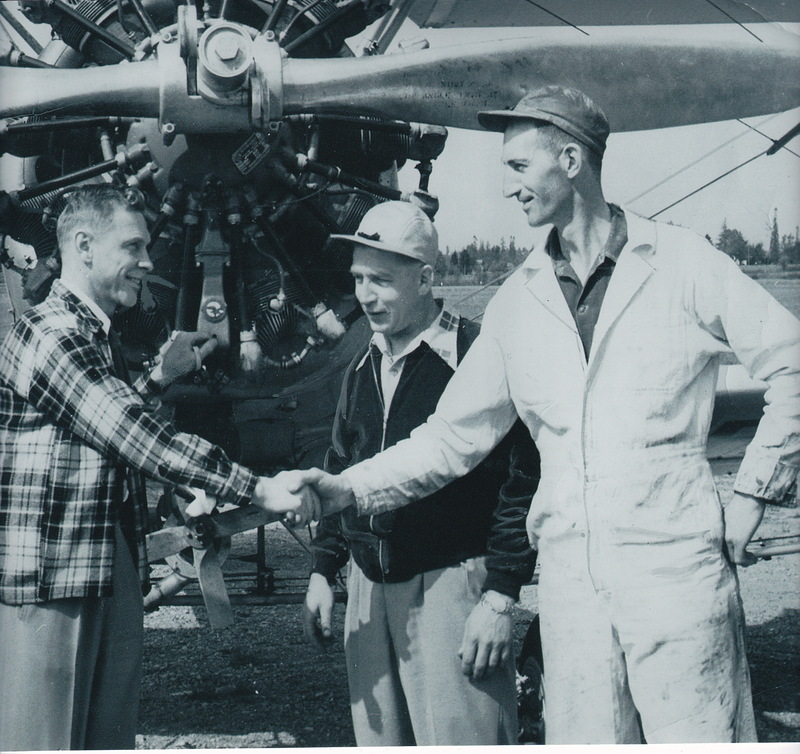 Skyway Air Services in Langley, BC, bought 18 TBM-3’s from the RCN through Crown Assets in 1958 and 1960, and two 40-foot trailer loads of spare parts in 1960. In 1958, six aircraft were “tanked” and converted to into sprayer/bombers at the Fairey Aviation facilities in Sidney, British Columbia. 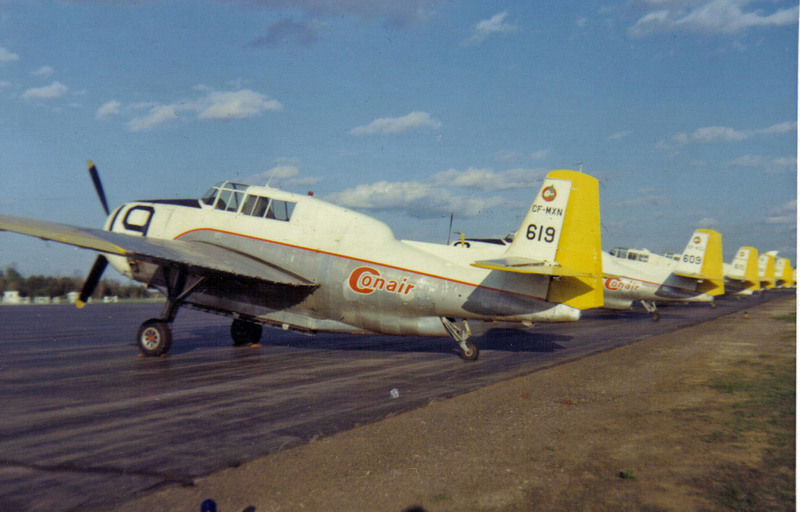 These were #600 CF-IMJ, which crashed in 1958 in New Brunswick, #601 CF-IMI, #602 CF-IMK, #603 CF-IML, #604 CF-IMM and #605 CF-IMN. The remaining five were in use at Langley during 1959 and 1960. In 1960 Skyway purchased 12 more Avengers when the RCN struck them off charge in July. See the table for details. 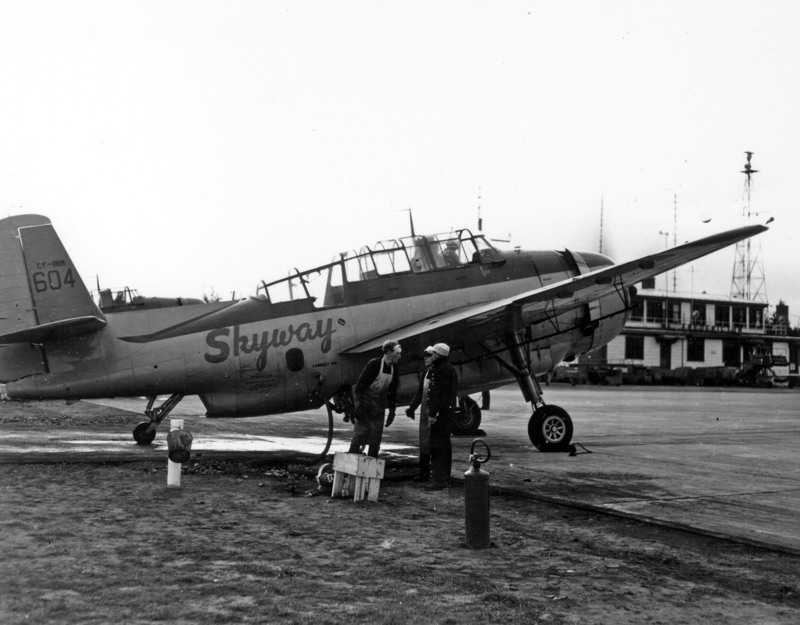 Skyway Air Services was awarded contracts in 1957 and 1960 to conduct aerial spraying against the western black-headed budworm in British Columbia. Four TBMs, undoubtedly the Ball-Ralston aircraft, were employed in 1957, the first year that TBMs were used in forest spraying operations. Skyway’s TBMs usually arrived in New Brunswick by mid May and returned to the west coast in June. [Asterisks denote duplicate nose/tail numbers, which came about because of Skyway’s habit of re-assigning the number after an aircraft had crashed.] Note: There is no FKCI on the list of ex-RCN Avengers and there is also no #613. A series of black-and-white prints found in the FPL files showing TBMs over rolling terrain typical of New Brunswick are undoubtedly from the early 1960s, and feature four of the five remaining Avengers purchased in 1958 (#602, #603, #604, #605). One image definitely shows the old Fredericton Airport building sporting the Fredericton sign. I am guessing that the year was 1960, but how could these five Avengers spray in British Columbia as well as New Brunswick (usually May and June), which was on the other side of the country? Lejeune says: “The operation was scheduled to begin about June 15, 1960, but because of retarded insect development and unfavourable weather, it was not started until July 17 and was completed on July 23.” The late start in BC would have given Skyway an opportunity of spray in NB. Still, confirmation is lacking. Skyway TBM #605 and one other FIMN spraying probably in NB in 1960. Skyway TBM #604 FIMM loading in front of the old Fredericton airport building. Avengers owned by British Columbia Company Skyway Air Services from 1958 to 1968. 619 FMXN 1960 – – – – – – – – – – – ? 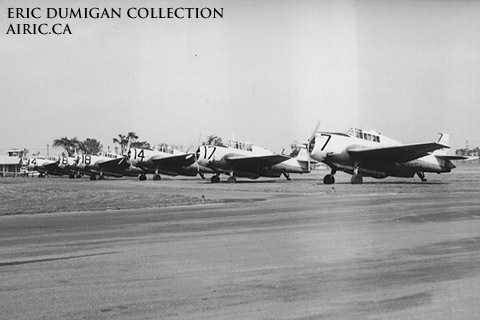 After March 1951, the RCN Avengers were painted Gloss Dark Grey on the upper third of the fuselage, on the upper wings, and on the tailplanes and elevators, and Gloss Sky below. After mid-1952, a third colour scheme appeared and stayed until the surviving Avengers were retired. This was Gloss Dark Grey as above but Gloss Light Grey below. Some of the Avengers converted by Fairey Aviation and eventually acquired by Skyway Air Services retained this colour scheme for a few years [Pettipas 1988]. The Skyway logo was bright red in this early scheme. I don’t have any images of Skyway’s Avengers from 1962 to 1966, but images from New Brunswick in 1967 clearly show that the fleet has been repainted to the standard Skyway-Conair-FPL scheme. Larry Milberry (pers. comm. 2008) tallied 10 Skyway Avengers on May 22, 1961, in Cartierville, Quebec, while they were on a refuelling stop. His notes at the time said “En route to Fredericton, NB, for bud worm fighting.” The 10 Avengers were: FIMK (#602), FIMM (#604), FIMN (#605), FKCH (#606), FKCJ (#607), FKCK (#608), FKCL (#609), FMSX (#610), FMSY (#611), FMUE (#618). A group of four unidentified Avengers in Cartierville, Quebec, as recorded by Larry Milberry, May 22, 1961. In fact, 12 Avengers made the trip out east, in three groups of four. According to a newspaper article dated probably May 17, 1961, and provided by Tom Wilson (pers. comm. 23 Jan. 2014), who lead the first four from the Abbotsford Airport, “this was the largest contract that the local firm has yet handled in the annual battle” in New Brunswick. “The first four took off Tuesday last week under the leadership of Tommy Wilson. Four more left later in the week and the final four headed east last Saturday. They took two days to make the cross country flight, flying only in daylight hours and making 500 to 600 miles between refuelling stations”, entirely within Canada. The inclusion of Avengers FMSX and FMXY in this history are based on Larry’s observation, as FPL did not have any records of what Avengers flew in New Brunswick during the early to mid sixties. I don’t have any records of which Skyway Avengers flew in New Brunswick in 1962 and 1963, but 14 aircraft made the annual 2,800 mile (4,500 kilometre) trip in 1964, 1965 and 1966, Skyway’s entire fleet. In 1966 and 1967, detailed calibration checks by R.E. (Rudy) Hanusiak identified all of the aircraft, but details are lacking for 1968, the last year that Skyway owned and operated their Avengers. The mystery Avenger is #619 CF-MXN, which had gone through several owners before being purchased by Conair. The table has a ? for that year, as I have an image of it in Skyway colours, below. 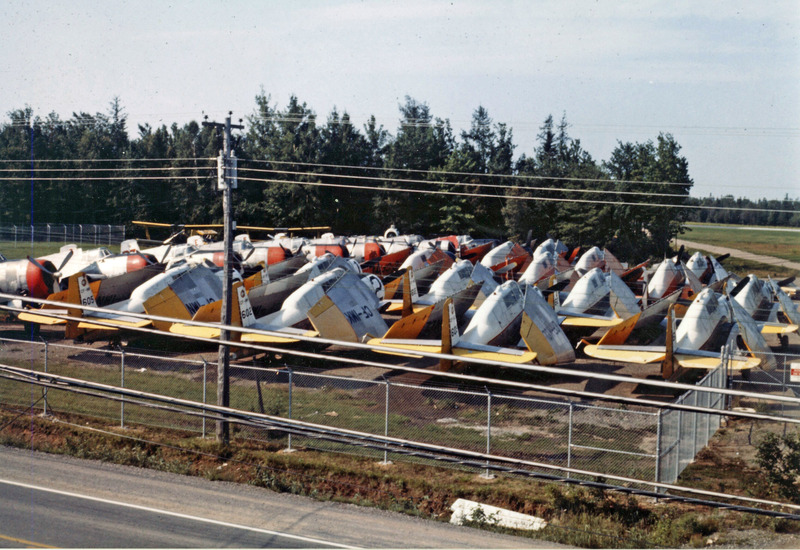 The nine Skyway TBMs that Skyway sent to NB at Dunphy Airstrip, 1967. They are, from left: #606 FKCH, #602 FIMK, #612 FMUD, #618 FMUE, #604 FIMM, #615 #FKCG, #605 FIMN, #607 FKCJ and #608 FKCK. Arthur (Art) Seller, a pilot instructor in Vancouver, British Columbia, who had dreamed about having his own aircraft while a prisoner of war in Germany, bought a war-surplus de Havilland Tiger Moth two-seat trainer and founded the Royal City Flying Club at the Vancouver Airport in 1946. He later acquired a second Tiger Moth, one of which was used as a trainer while the other was modified for crop dusting. In 1947, Seller moved to Langley, which at that time had only a grass landing field – an emergency landing field for Trans Canada Airlines. Business was good and the company grew. In August of that year, the name of the company was changed to Skyway Air Services Ltd. In 1949, Seller acquired a third Tiger Moth; this one for spraying rather than dusting. When it was realized that the tigers were not large enough for profitable crop dusting, Seller acquired several Stearman aircraft, and modified them for crop spraying. Skyway letterhead, 1960, from a letter in the FPL files. Late in the 1940s, the Province of New Brunswick was experiencing a severe attack of the spruce budworm … and was calling for help. Skyway sent a fleet of five Stearmans east each spring for several years, on a budworm contract [to Forest Protection Limited]. They usually returned to British Columbia before the end of June to be ready for the forest fire season. 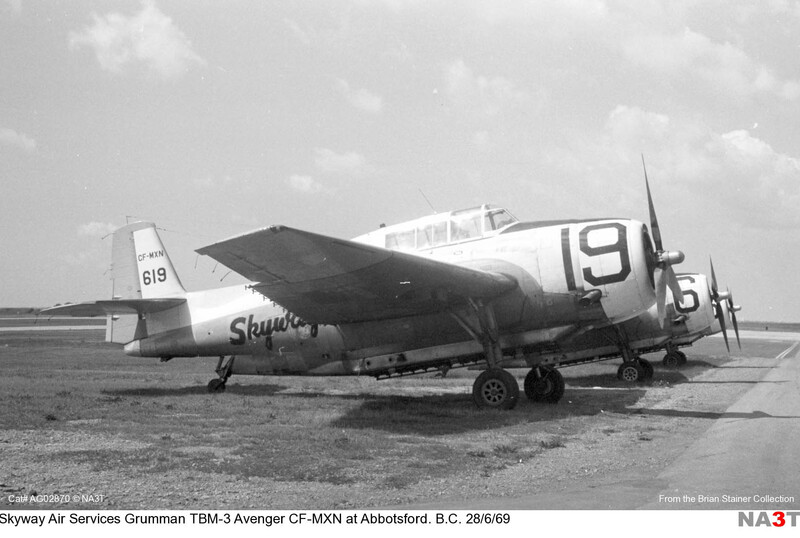 While they were away one spring there was a budworm infestation on Vancouver Island and Seller called in three Grumman Avenger aircraft from south of the International border [the Ball-Ralston TBMs]. Thus seeing what they could do, he bought war surplus Avengers from the Royal Canadian Navy in 1957; by 1961 he had purchased 19 Avengers for prices ranging from $1700 to $7,000. Fairey Aviation, at Victoria modified them for Skyway’s use. 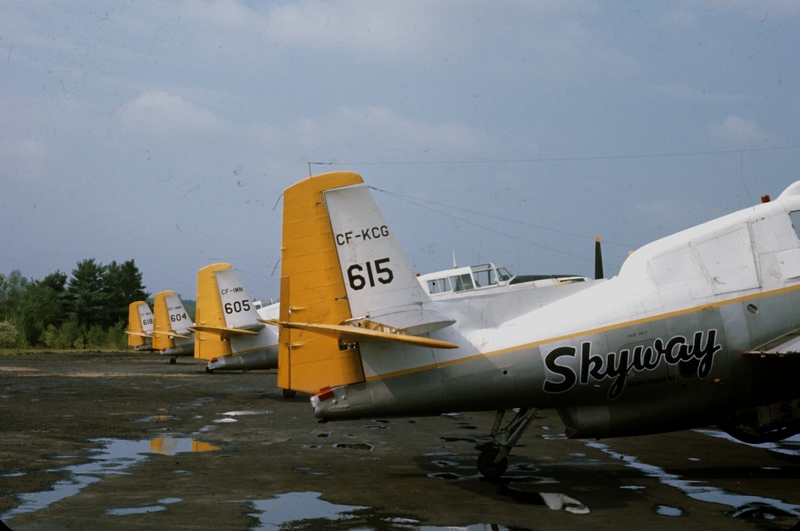 At its peak, Skyway Air Services employed nearly 100 people for a fleet of 70 aircraft. The business was thriving, and the company was doing much more than spray or dust crops. They had a pilot training school and a charter service plus an airplane overhaul and maintenance service. In 1968, Art Seller suffered a stroke and decided to divest himself of the business. The following year, the spraying and fire-retardant bombing part of the business was sold to a consortium led by Les Kerr who named the new company Conair Aviation. In 1965 Skyway moved to the more spacious Abbotsford Airport from its original base at Langley. The new colour scheme. Skyway TBMs #604, #605, #615 and #618 parked at Dunphy, NB, June 1967. This scheme was carried over to Conair and later to FPL. Skyway Air Services Ltd. of Langley B.C. operated a number of Boeing Stearman and 5 Grumman TBM Avengers. The Avengers, surplus Royal Canadian Navy anti-submarine aircraft, had been purchased in the fall of 1957 and converted to spray configuration by Fairey Aviation of Victoria. Four of these aircraft took part in the annual spring spraying of spruce budworm in New Brunswick. On their return to B.C., in anticipation of their new role as fire bombers, Skyway had tank gating systems installed to allow for the dropping of water or other suppressants. Due to the success of the operations in 1958, by the spring of 1959 operators had equipped up to 18 aircraft with firebombing tanking systems including 5 Beavers, 5 Avengers, 5 Stearman, 2 Junkers and 1 Husky. 1962 was … a pivotal season with the program. The British Columbia Forest Service entered into the first firebombing contract with Skyway Air Services. This was for the provision of 12 Avengers and 4 birddogs to be based equally at Smithers, Prince George, Kamloops and Cranbrook. The 1967 season was the heaviest for the use of all aircraft to date with over 20,000 hours of flight time logged. Contracted Cansos and TBMs accounted for nearly 725 hours and non contract bombers over 3000 hours. The Cansos worked in all five Forest Districts. The non contract aircraft included three spare TBMs and two Ontario Air Services DHC 3 Otters with internal float tanks. 1968 was a somewhat quieter season with 4 Cansos, 11 TBMs and 5 birddogs on contract. 1969 was interesting on a number of fronts. The air tanker component of Skyway Air Services became Conair Aviation Ltd. at the end of April. [In 1969], the Abbotsford operation [Skyway Air Services], the spraying and retardant bombing part of [Art Seller’s] business, was sold to a consortium led by Les Kerr, whom he had taught to fly and who had become a spray pilot with the company. The Skyway name stayed with Seller, and Les Kerr’s new company was named Conair Aviation. To Art Seller’s delight [Conair] continued to grow and prosper at Abbotsford under its new management. Today, having in turn divested itself of the crop spraying business [by selling its remaining Avengers to FPL], Conair is world famous for its water/retardant bombing services and techniques and related aircraft and equipment development. Under current President, Barry Marsden, it continues as a leader in its important specialist field. Avengers owned by Conair Aviation from 1969 to 1977. 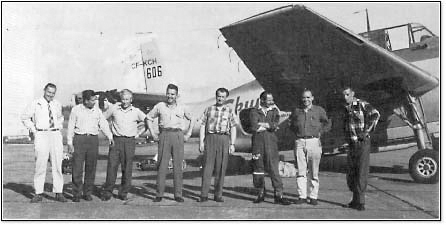 The eight remaining Conair Avengers went to Forest Protection Limited in August 1977. According to Robert M. Stitt (“TBM Tales”), Conair’s last nine TBMs left the Abbotsford base in the spring of 1976 for New Brunswick, for the last time. CF-KCG #615 was lost while spraying in May, but the remaining eight completed the season and were stored at FPL for the winter. They also sprayed in New Brunswick for the 1977 season as Conair Avengers, and were officially purchased by FPL in August 1977 for $40,000 each. 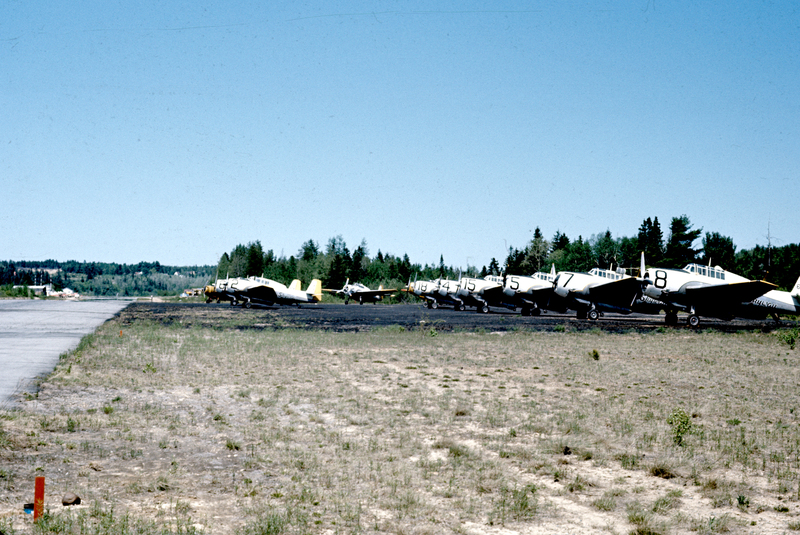 Eight Conair TBMs stored at FPL in two rows of four, Fredericton NB, probably Fall 1976. The circular Conair logo can be seen near the tips of the tails above the registration. The nose of CF-KCG #615 can be seen in the very back under the trees. Gord Bell writes in a history of the BC Forest Service (2011): The decades associated with B.C.’s air tanker program provided interesting events and milestones and the 1970s did not disappoint. The success of the short evaluation the previous year resulted in the first contract for the A26 type in 1970. 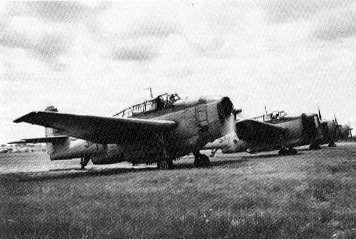 Three A26 Invaders joined three Cansos, five TBMs and six birddogs to form the provincial fleet and spare TBM aircraft were soon added. The TBM Avenger ended service in B.C. in 1975 after eighteen seasons. Conair would continue to search for a replacement for it, and ironically the A26, for future years. 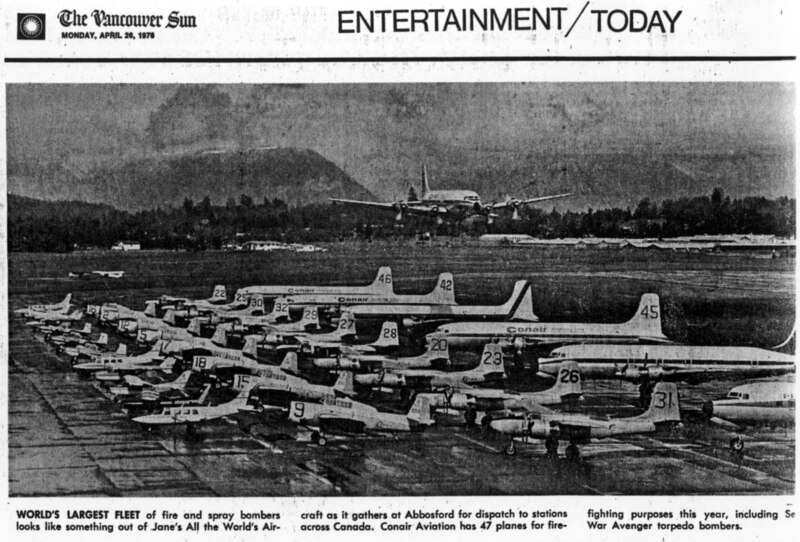 The Conair fleet in 1976, which included eight Avengers. While searching around for information and pictures for an upcoming decal project, I was amazed to find two photos on here of my stepfather, Peter Deck, from his Skyways years! I knew he had flown Avengers in the Spruce Budworm project but I didn’t know he flew Stearmans as well. When my mother married him in 1976 he was the owner of Kent Aviation Ltd and general manager of Chilliwack airport in British Columbia. He sold the business and retired from aviation in the early ’80s (I think). He died several years ago. While looking for information and pictures of Avenger water bombers for a future decal project, I was amazed to come across two photos of my stepfather, Peter Deck, from his Skyway days! I knew he had flown Avengers in the Spruce Budworm project but didn’t know he had flown Stearmans as well. When my mother married him in 1976 he was owner of Kent Aviation Ltd and general manager of Chilliwack airport. He sold the business and retired from aviation in (I think) the early ’80s. He died several years ago. Hi Andy, My father was Herman “Slim” Knights, VP of Conair and former pilot at Skyways. I realize it’s been a while since you wrote here, but if you’re still looking for decal info, my brother may be able to help. He’s a model maker and still works at Conair. An excellent site, thank you for your efforts. Greatly appreciated my an old Avenger lover who flew in one of these planes. Second biggest thrill of my life.